"John Grey grew up to manhood under the kindly inspiration of his neighbour George Culley, and he soon became a well known figure in the agricultural life of Northumberland. He was a great reformer, and championed such causes as parliamentary reform and the abolition of slavery, and, much to the surprise and horror of his friends and associates, was a constant advocate of the repeal of the corn laws. In 1833 he was appointed to take charge of the Greenwich Hospital estates, and he moved to Dilston. He never ceased to contribute largely to the agricultural literature of the time, working always on the principle that if agriculture was ever to rank with the other great sciences, 'the culture of the mind must precede that of the land.'" From "A History of Northumberland, Vol XI, written in 1922. It can be read online here. 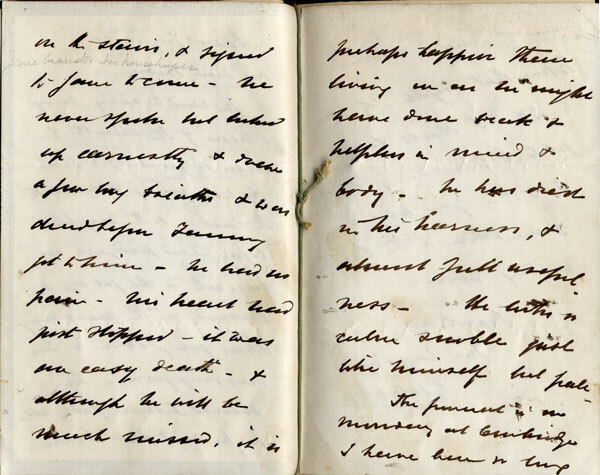 John Grey's daughter Josephine Butler wrote an account of his life. This is the 1874 edition. The book has been digitised by Google and can be to read on line here. Died on 22 January 1868 at Lipwood House, Haydon Bridge. 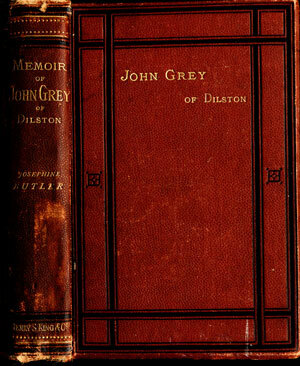 "JOHN GREY OF DILSTON." 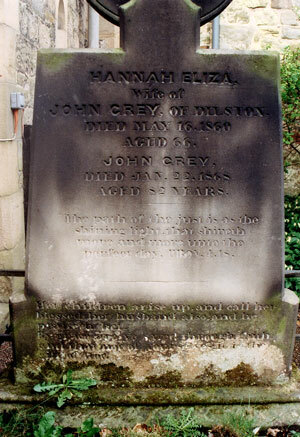 John Grey was descended from the Greys of Angerton, a collateral branch of the historical Northumbrian family, settled on a small patrimony at West Ord, on the south bank of the Tweed, two and a half miles west by south of Tweedmouth. His father, George Grey, had settled at Milfield Hill, six miles north-west of Wooler, where he died in 1793, leaving his widow with four children, of whom John was the eldest His boyhood was spent at Richmond School, in Yorkshire, where he had the privilege of passing holidays with the greatest agriculturists of that day — men whose names have been handed down to posterity as benefactors of their kind — the Collings, the Charges, and the Booths. From them he heard discussions on agricultural subjects, and on the revolution in stock- raising created by the introduction of short-horned cattle. He was privileged to make himself acquainted with the patriarchs of that esteemed bovine race — the "Favourites," the "Comets," and the " Dukes " — whose names stand on the foremost pages of the Herd Book. Family circumstances required that he should, at the age of eighteen, take the management of extensive farming concerns. Thus early put into harness, he was preserved from many temptations to which young men of the upper middle class are often subjected, and the hard work to which he had to apply himself tended in a marked degree to produce that earnestness of character and aptitude for business which distinguished him throughout his life. The principal farmers of Northumberland had begun about that time to form agricultural societies for mutual encouragement and instruction. One of these was the Tweedside Society, established at Cornhill, near Coldstream, about 1815, and amalgamated in 1820 with the Border Society at Kelso, under the title of the Union Agricultural Society. Mr. Grey was one of the earliest members of that Society, and was for many years one of its most successful exhibitors. 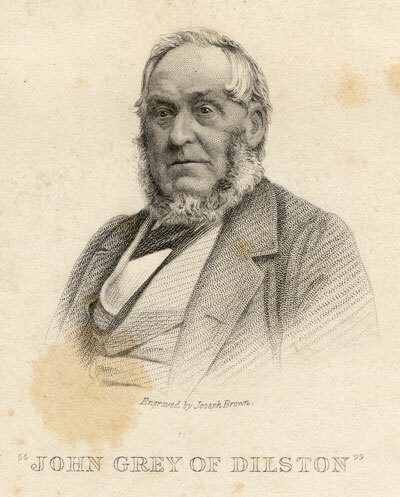 Obtaining by diligent study and hard work a recognised position among the agriculturists of the North of England, he became known to that fast friend of the British farmer, Sir John Sinclair, first president of the National Board of Agriculture. When the baronet was engaged upon his "Code of Agriculture, including Observations on Gardens, Orchards, Woods, and Plantations," he called Mr. Grey to his aid, and referred to him various sheets for remark and criticism, so that it was his privilege, even at that early date, to study agriculture in theory, as well as in practice. At a later period he had the honour to be consulted by three remarkable men — Lord Althorp (afterwards Earl Spencer), Mr. Pusey, and Mr. Hanley, in originating the Royal Agricultural Society of England, and he was invited year after year to act as one of that Society's judges, and likewise to contribute to its publications. In 1833, Earl Grey, then, for the last time. Prime Minister, gave Mr. Grey the appointment of Commissioner of the Greenwich Hospital estates in Durham and Northumberland. This extensive and valuable property had been greatly neglected, although it was under the superintendence of two receivers, two clerks, and seven bailiffs. The net annual income of the estates was only £25,000, and the tenants were some six or seven thousand pounds in arrears of rent. Had he been so disposed, Mr. Grey might have contented himself by simply attending to his routine duties as receiver; but indolence and inaction were foreign to his nature. The farms on the estate were all valued by a competent valuer, an improved system of husbandry was introduced and enforced; and while the incompetent or incorrigible were weeded out, every encouragement and assistance was given to deserving and industrious tenants. While he looked sharply after the rents in the interests of his employers, he encouraged the tenants to improve their holdings, and being a farmer himself, he was able to advise and instruct them as to the best means of cultivating the land, and show them the art of growing rich themselves, while enriching the charity. He was a strong advocate for large farms, long leases, extensive and systematic draining, the application of chemistry to agriculture — of everything, in short, in the way of land improvement, and security of tenure to the farmer, conjoined with punctual payment to the landlord. When he retired, after thirty years' Commissionership, the net annual income of the property was £40,000 and the arrears of rent were £30 only. 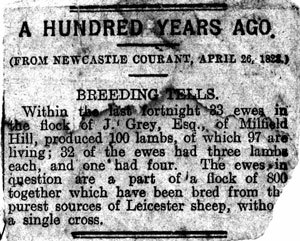 At the instigation of Lord Althorp, Mr. Grey prepared an elaborate report upon the practice of farming in his native county. It was entitled ''A View of the Past and Present State of Agriculture in Northumberland," and it was suggested by the superior farming which his lordship had noticed on both banks of the Tweed, when he visited Milfield. It was written in 1846, and published in July of that year in the second part of the second volume of the Society's Journal. So well was it received that the Journal Committee offered fifty pounds premium for similar essays, and from that time forward they received reports of more or less sterling value from all the English counties. Local appreciation of Mr. Grey's services to agriculture found expression in October, 1849, when he was presented with a handsome service of plate, valued at £300, by the members of the Tyneside Agricultural Society. Upon it was engraved the following inscription : — " To John Grey, Esq. Presented by the members of the Tyneside Agricultural Society, of which he was the founder, and by his numerous other friends, as an expression of the high estimation they entertain of his character and talents, and of his invaluable services rendered in the interests of agriculture." Finding the infirmities of age stealing upon him, Mr. Grey gave up his appointment in 1863, when he had attained his seventy- seventh year. Leaving the residence at Dilston with which his name is identified, he took up his abode at Lipwood House, on the banks of the Tyne, near Haydon Bridge, where he spent the remainder of his life in retirement. Mr. Grey had, from youth upwards, a predilection for politics, though not in the strict party or controversial sense. During the troublous years preceding the Reform Bill of 1832, he fought for the Liberal cause with inborn ardour and energy, and was looked upon by the leaders of the party as an active and useful ally, who might make his mark upon the floor of St. Stephen's. He was an elegant and effective speaker, not on political questions merely, but on general, and especially agricultural topics. 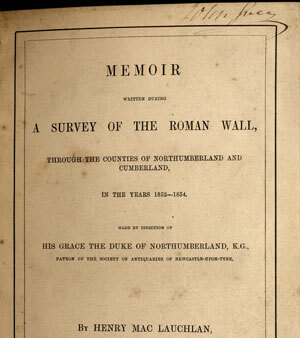 When the Royal Agricultural Society met at Newcastle in 1846, and the members, fifteen hundred strong, dined in their own pavilion, under the presidency of Lord Portman, the speeches were mostly of a high caste, but that delivered by Mr. Grey, in proposing "The Labouring Classes," was acknowledged to be the best. But he was utterly devoid of personal ambition, and though on several occasions solicited to come forward as a candidate for Parliamentary honours, he always declined. Free Trade, the Anti-slavery Movement, Catholic Emancipation, the Repeal of the Test and Corporation Act, and the great question of Parliamentary Reform, all had a steady, earnest advocate in Mr. Grey. 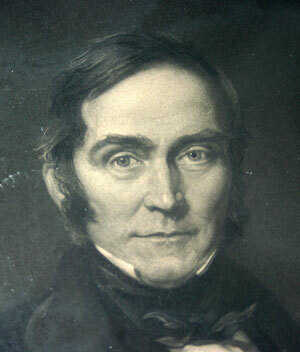 As early as 1824 he advocated Free Trade in wool, though that was the staple of the district in which he lived, and he seems also to have been in favour of Free Trade in corn for some years before the bulk of his party abandoned the theory of Protection. His political opinions, though thus advanced, were well matured, and were by no means the accident of birth or breeding. He held to them, moreover, with a strong tenacity, such as springs from an earnest nature and deep conviction. In his "Memoir," written by his accomplished daughter, Mrs. Butler, from which many of the facts contained in the preceding pages have been derived, is the following anecdote : — " On the occasion of the canvass incident to an election in Durham county, he rose one morning at three o'clock, took a horse, and rode out at that early hour, galloped through a wide district, obtained the votes of the Liberally disposed, and came home to breakfast. As he rode up the hill to the house, his tired horse stumbled and fell, and threw him over its head. Several of his ribs were broken, and he was a good deal bruised. He said not a word to his wife, but ate his breakfast, mounted a fresh horse, and rode off for the rest of the day to canvass another part of the county." After his appointment to the Commissionership he abstained from active participation in political strife, but to the end of his days he remained in sympathy with the friends of his early manhood — a steady and consistent Whig. In 1814, Mr. Grey married Hannah Annett, daughter of Mr. Ralph Annett, of The Fence, near Alnwick. By her he had a dutiful and talented family, most of whom survived him. The best known of them are George Annett Grey of Milfield Hill, a J. P. and D.L. for Northumberland, an assistant Inclosure Commissioner, and, like his father, a man of " light and leading " in practical agriculture; Charles Grey Grey, who succeeded to the management of the Greenwich Hospital Estates; and Mrs. Josephine E. Butler, an ardent social reformer, and the author of her father's "Memoir" — a delightful book which every true Northumbrian reads with mingled pride and pleasure. Mr. Grey will always be remembered as a benefactor to the British farmer. The better part of his life was spent in the endeavour to increase and multiply the fruits of the earth. He was a striking type of that robust race of Englishmen, of which the north-eastern district has been prolific. Possessed of an excellent constitution, and a powerful and vigorous frame, he was capable of undergoing great fatigue, and his life was spared beyond the proverbially allotted term. The great monetary panic of 1857, when the Northumberland and Durham District Bank closed its doors, was a great blow to him. Being a large shareholder in that unfortunate concern, in the management of which he had had implicit faith, he felt the catastrophe keenly; but, nevertheless, he held up to the last, like the sturdy Northumbrian yeoman that he was. He died at Lipwood House, on the 22nd of January, 1868, aged 83 years. 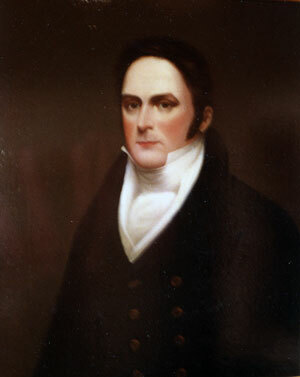 A full sized portrait of himself, by Patton, was presented to Mr. Grey at the time of his removal from Dilston. It was afterwards exhibited in London, and then placed in the new hall at Hexham. From Men of Mark 'Twixt Tyne and Tweed, ps 376-379 by Richard Welford, published in 1895 which can be read on line here. John's father died in 1791 when John was 6. 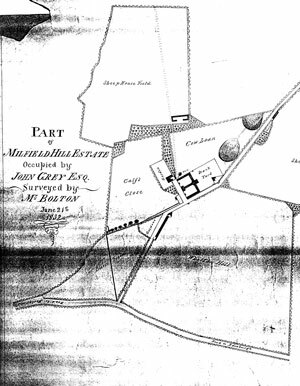 As an adult John farmed Milfield Hill until 1833 when he passed the tenancy to his son George Annett Grey. A carte de visite by W & D. Downey Photographers, 9, Eldon Square, Newcastle upon Tyne. Written on the back in John Grey's handwiting : "1. Earl Grey, 2. John Grey, and 3. Alderman Laycock". They are attending an agricultural show, possibly the Royal Agricultural Show which used to be held on Newcastle Town Moor. 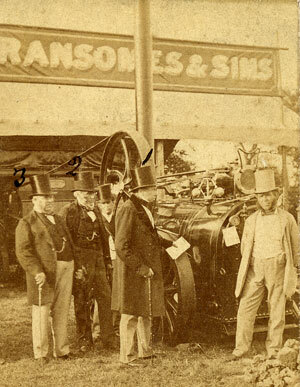 The steam engine by Ransomes was a portable type and first exhibited in 1841. 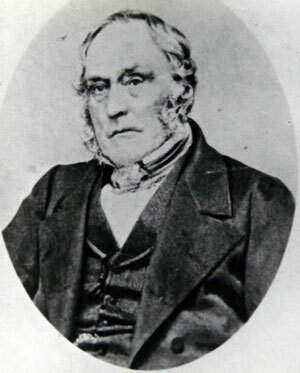 William Sims became a partner in 1852. The engine used a belt to drive a thrashing machine which can be seen behind the group. Ramsomes based in Ipswich now make lawn mowers. Thanks to them for the information about this engine. Downeys worked from 9, Eldon Square, from about 1860 and John died in 1868. 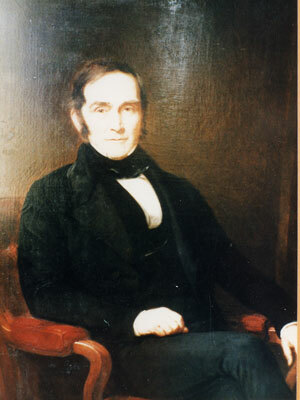 Above: G. Patten's portrait painted in 1852 is now in Berwick Museum. An copy engraving is in the National Portrait Gallery . 7 Josephine Elizabeth Grey- born at Milfield Hill April 13th 1828 Baptised at Milfield Hill 30 May 1828 by the Revd John Wood. Curate of Kirknewton. 9 Eleanor Margaret Grey- born at Milfield Hill March 2nd 1832 Baptised at Milfield Hill April 16 by the Revd C. Robinson Died at Milfield Hill 22 July 1834, of scarlet fever. Buried at Kirknewton 25th July. A lovely amiable and affectionate child The lord gave and he hath taken away Blessed be the name of the Lord. J.G. Left: John and Hannah's family Bible dated 1811 Printed in Edinburgh by Sir D. Hunter Blair and J. Bruce. Emily 's birth was recorded on the other side of this page. Left: a photograph dated 1863. Right: the sepia photograph was taken in Geneva possibly when he went to visit the Meuricoffres. 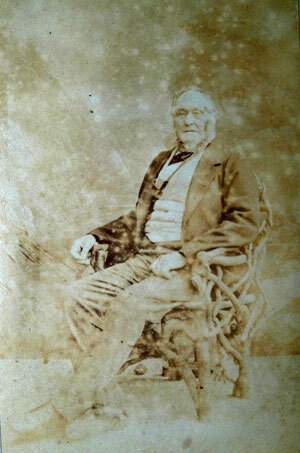 John Grey photographed in his old age. Thanks to Jane Jordan for the picture on the right reproduced in her book on Josephine Butler and to David Thompson for the other three photos. 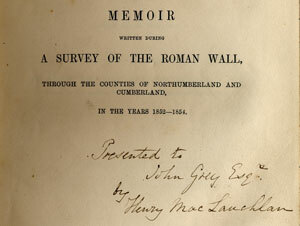 Mac Lauchlan's book written in 1852-54 and published in 1858. 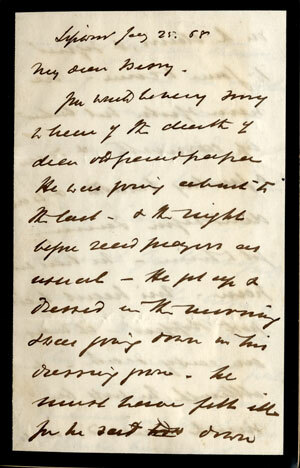 Left: George Annett Grey's letter to his daughter Bessy describing his father John's death. He married Hannah Annett on 27 Dec 1814 at Alnwick. A framed portrait from Milfield Hill, described as " engraved by J. B. Hunt from painting by J. Carrick", when used as Plate 1 in The Farmer's Magazine of July 1846. No 1. Vol . XIV. Left: From "The Milfield Manuscript or A Genealogical and Historical Account of the Grey Family of Northumberland” by Edmund Hepple (1856) page 47.
Letters. These are difficult to read; italics, question marks and gaps show disputed words and names. ?Your’s is just come. Surely you would be of much more use before the sale, at ?sorting and ?regulating & if you could be at Wooler fair on the 4th you could perhaps do some wine business. I shall have to back ?early in the end of the week, about the 12th as ?rent days occur on the 15th. Let me know as soon as you can, because if you are to be there I shall not puzzle the ?Heals/Steeles with written directions. Dear Robert, I have your favor giving me a statement of your views & reasons for deeming it advisable that you & George should ?embank?embark an additional sum, to the extent of £2,000 in your private trade. The thing appears perfectly reasonable, your experience now must bear the stamp of authority in such matters. And George expresses his concurrence in the view you take of it. But what best? You mention the kind of security you mean to propose, which, was there any doubt of your ?previous circumstances would hardly be a fair one I imagine to your previous creditors in the way of borrowed money,- because it is like going to the last one that hold of a fresh mortgage, leaving the former to come in for his chance after the other was served. I don't know whether it occurs to you that there is any undue preference in such a transaction, but it rather bears that appearance to me. Do you think that the knowledge of such a transaction would be likely to have the effect of causing a previous creditor to call in his debt, if so then it would seem that the preference in the latter case is hardly justifiable-but you are much more au fait to such matters than I am. I hoped that your large profits in the import line would have kept you from the necessity of going again into the market for money -for I expected that you were in the way of clearing several thousand per annum , and that, without the advance of capital on your part . I had also a little doubt of the ?proficiency?propriety of admitting a third partner into your private concern who could neither produce any share of capital nor offer any security for what it might be needful to borrow-but of course, you are the best judge of the price at which it was right to purchase Mr. Bacon's services. I have no right or wish however to sift your private circumstances or motives of action. But since you have so far laid the case before me, I feel inclined to ask -what next? Is it merely for my approval, or with a view to beg assistance in raising the money? Had I anticipated such a demand, I might easily have retained £1,000 that I paid a year ago to Mr Davison of Wooler - and would not have had much difficulty in finding a second. He left that cash at the time in the Berwk. Bank -having no situation for it . Should it chance to be there still I could easily get it, by giving my own bond. On account of some ?operations, I fear the dividend from our Collieries this year will be small-but I am to be in Glendale in the middle of July & shall enquire into both these matters, & if you wish it, try to help you. You must let me know the time when the cash would be required, that I may calculate my chances of obtaining it, as well as my own resources i.e. if I am decided to take my hand in it. I thank you for your kind interest in my views respecting John Henry, & offer of assistance. If he is to hang on for a year or two waiting for something to decide his calling it is of importance that he should not fall into habits of indulgence and misapplication of time. That however can be discussed hereafter-should any employment be found for him. He is naturally very acute in the management of matters-but wants regularity of habit. C. Lundie has left us to go to Manchester but should he fall in with no employment there, will proceed to London directly. I'm glad to learn better acct of Mrs Selby. We are all well- & all at home now. I am Dear Robert yours faithfully J. Grey. Kind Rmens. to George." My dear George Finding that you have not yet set out, by the letter yr mother recd yesterday, I take the chance of letting you see Mr S’s letter to me – it is generally reasonable and intelligible. & the only use in sending it to you , is that it many contain more than he is accustomed to communicate to yourself. Corie was here yesterday and is gone to Newcastle to get his address printed and to make his bow to all the Aldermen and ?Councillors, to try if he can get the appointment of ?resident ?burghers on the Tyne. This is to be decided on the 10th January. I have given him 16 letters of introduction to Mayor & Aldermen. Should he succeed, it will be a respectable and improving appointment- the salary £300 a year, if not, he will be at large again & may ?indicate/meditate joining you. The whole family is here now but yourself, whose absence we much lament. John & the girls ride daily, as the weather is generally mild. Tully has been twice on Blacklocks. Charley came home on Xmas day - his illness having passed away – he is much improved and a fine sensible boy. George ?Cranston says that the ?Heals/Steeles of Branxton have taken the Floddens at 33/ per acre – and ?Idderson is to get King’s Chair & the adjoining fields at 40/s. Col. Nicholson was here the other day. ?Geo Darling has not taken Jenning’s farm, but the ?livestock & stable. I am obliged by your remarks about Greenwich & very glad to find that they appreciate my labour in their behalf. I shall be most anxious to know of your safe arrival over the water, but hope you will have time to drop a line when you prepare to go on board, that we may know when you are on sea. I shall leave the remainder of this sheet for female gossip. So goodbye my dear boy & may God bless and prosper your journey “per mare et per terra” & give you a safe return to old England – your loving Father. John Grey. My dearest George, I don’t think there is much to add to your father’s letr. We are quite a houseful here and the weather being fair they all enjoy their holidays very much. I wish you were here too my dear fellow. John soon got quit of his cold & seems quite well, he has made a cash book & a ledger and is quite full of himself, he works in the office for 2 or 3 hours every day. My poor mother was buried on Tuesday, in the new burying ground on the Carlton Hill. We shall be very anxious to hear of your safe arrival beyond seas, and pray that God may be with you and watch over all your voyages. We all send kindest love. Lee has leave of absence for a fortnight, she has …? here. William and Dr Cargill came up on Wedy and spent part of the day. I am ever my dearest George your very affect. Mother. 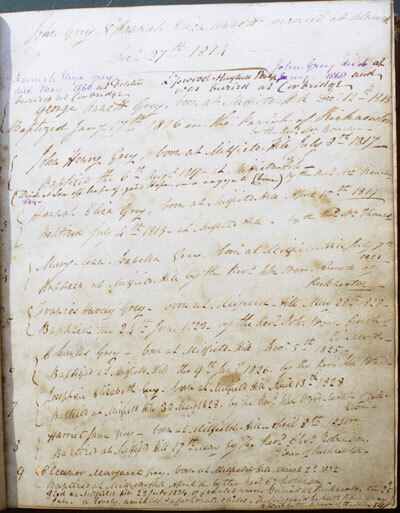 25 April 37.The letters from John Grey and his wife Hannah Eliza to his eldest son George aged 22 who was working in the wine trade in London. The children at Dilston in 1837 consisted of John, 20, Tully, 16, Frances, 14,( later called Fanny but may be the Frankie referred to in the letters), Charlie, 12, Josie, 9, Hatty ,7 and Emmy the baby aged 1. Daughter Eliza,18, had married, William Morrison in 1836, when she was 17. Dec 30th 1837 George is about to leave for Portugal where he investigated the wine business from January 7 to June 13, 1838. Mr S. may be Robert Selby one of his partners. Corie may be Cornelius Lundie the son of John's sister Mary, whose father the Rev Robert Lundie died in 1832 in Kelso. Hannah's mother was Hannah Hardy. "Thomas Hardy died 13 September, 1798, aged 60 years. Monumental inscription, Alnwick. His daughter, Hannah, married Ralph Annett, of Alnwick, and died in Edinburgh, 29 December, 1837." From note page 280, "Six North country diaries by John Crawford"
My dearest Geo- By the time this crosses the seas you will be glad to hear from home. We are all anxiously looking for news of you & hope ere long we shall have a long letter. Nothing very extraordinary has happened since you left. We had a good ?round party for some time. Eliza and Johnny staid about a fortnight, they rode a great deal, Tully on ?Blacklocke, Lee on Rufus. John or Papa on Silverlochs & Frank or Paddy on Apple, they made quite a kick up in the country. Willm came up twice, one of the times to see John, who got a nasty ?ulcerated throat & had a deal of fever for a few days, but it soon went off and he is now quite well again, he is in the office a few hours every day. Frank & Charley ret.d to school this week, & Tully goes in day or two. We have now a deep cover of snow, Papa has this ?morning arrived from Milfield, where he has been for a week, a great deal of snow has fallen but as it is quite calm there is no drift, the frost is very intense. the thermometer in Papa’s room was one day 13 degrees below freezing, our pump has been frozen some time and in the morning in attempting to lift a juglet, the ?basin refuses to be separated from it, and it requires as much bashing as if you were at the north pole, before the utensils & water can be made available for washing yourself. You will have heard of the Exchange in London being burnt down! & when the flames were just catching, the clock tower, the chimes struck up” There’s nae luck about the house”. The Emperors palace in Petersburg, and the Italian Opera in Paris are also burnt down. Lord Durham is going out to Canada to be Governor General and ?Commissioner, to settle all disputes as he best can, it seems to please the liberals but the Tories are making a ?perhaps about it. Papa bro.t such a splendid waistcoat for you ?worked by ?Mrs Darling, it is beautiful flowers embroidered on scarlet, when will you wear it! I sent the little darlings some ?dissected ?picture scraps & toys by Papa. I really ?don’t find I have much to say wch one wd think worth sending so far, one feels as if a letter going abroad shd be more substantial than every day chat. The Rascals go on as before their ?doves were bought to land on New Years day, but the twins have died. And Baby now consoles herself with cuddling the black whelps. Baby keeps pretty well considering her teething, she says she is a “Tee total Lady” and makes a curtsey after the fashion of a ?Saloon and learns many monkey tricks. John makes fun for us when we are dull, he is a queer lad, but makes himself very pleasant and agreeable, he and Jack Dodds have had as many cabinet councils & consultations these two days abt 3 or 4 ewes, as you and Tom wd. had abt. all the Milfield flock. ?Corie was beat at the engineership, and we have not seen nor heard of him since , he was one of 5 chosen out of 32 candidates to stand a poll, and he was at the foot of the 5. When you write be sure & send a bit message to Lee , she is frightened that you will begin to feel as if she was not “one of us” now she is separated, she was very caring and kind & enjoyed being here very much, she is a fine, prudent lassie. Wm. is very polite to me now, and I hope we shall go on very well. Johhny grows a great merry laughing ?call… he looks as if he wld. be a thorough hearty honest chap, he thinks everything that is done is for his amusement and if his Grand papa was reading the paper well he wld let up a great shout and a laugh as if it was very funny Bad ma, send love, he is ? ? he practice sing, he good voice & learn after all, he wish he at fancy ball wid you, & see young officer. God bless you dearest George tell us all your adventures it amuses us much- ever your loving mother H E Grey. My dear George, though there is nothing new to tell you, I fancy a letter of ?gossip of any kind from ?father will be agreeable. We have a dreadful frost, such as has not been since 1814 when we used to ride across ?Yale on the ice. I was at Milfield for a week. ?Things going on well, ?plenty turnips having been stored. ?Corn little money this year. Barley ?charged/conveyed 19/6 up to this time, buck wheat miserable. The young horses and ?foal very ill of distemper. The colt off the bay mare likely to die. I was a night at ?Fowberry & wonder how the ?Land of Black Prince at the this time ?takes a tender wistful looks at the storm. No riding or walking for idle folks and even the hall too cold for billiards, but now the debates about Canada, the fires that have destroyed the Royal Exchange, Lord Stanhope’s, & Wm Ward’s houses in London and the new palaces at Petersburg, and the Cockneys insisting on ?drowning under the ice in the ?Parks, in spite of police, have come to their ?rescue. Sinclair and George came to meet us at breakfast, I rode to ?Westwood/Wheetwood with them and saw Wm and ?. Old Captn ?Masson & daughters, got a fine vest for you, scarlet embroidered, only for a hunt or fancy ball, seldom used I ween. George has agreed with Howie for the farm and crop, so that he takes full possession on May day-but does not know where he is to go to during the rebuilding the houses. They had a terrible run from Nesbit by Doddington,? Bender, Akeld Hill and killed in Akeld Mill. Langland’s horse broke a ?leg in the ditch between Turvelaws and ?Beach and was killed in the field. Culley was so clever as to ride along the road by ?Barrowbeck to Humbleton, and soon found and took a fox to Middleton, thinking he had the ?hunt but it was a changed fox while the other was being worried at Akeld. Groves was second on the way ? and then Major’s ?went on your grey horse wh is doing well. They had another day a good run from my covert and killed near Downham. They are negotiating the sale of Downham with ?kaffy. Lord Durham is appointed Governor of Canada with ?after powers wh gives satisfaction , & ministers have ?placed even by the explanations of the matter. They had a grand ball at Wooler and all the carriages being belayed in the street had the leather ? apron off and otherwise damaged. George’s among the rest. Steele has begun to work at Flodden, so he must have got the place. No new buildings to go on. ?Corie has got no place. John Rea has bot Reedsford. But is to farm it. Pinkerton to be married soon and to keep the house for another year. I am in fear of drifts, the snow is light and hard and wod blow easily. My ?Heifer are to move from ?Haydon to ?Newbrough tomorrow, and c.od be in bad plight if prevented, having no meat left. I am constantly thinking of you and wondering where you may be & how you have ?fared. Let us know as often as possible. Tully and John are sitting by and send loves. Small Emmy is playing all her tricks on the hearthrug and every body shivering and creeping to the fire. I hear of several of your orders being executed, but you seem to have forgot ?ours. Can you ?send ? ? ? my dear boy, with earnest prayers for your preservation. Your J. Grey. 20th and 22nd Jany 1838. 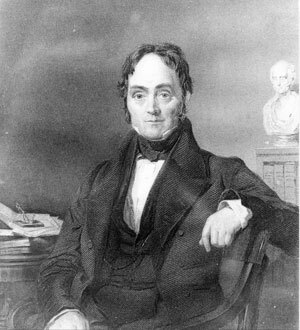 William Morrison who married Eliza was a doctor. Hannah calls her second son John a "queer lad" and there are worries in other letters about his future career. He died at the age of 26 in 1844. Corie, if this is Cornelius Lundie was an engineer in 1832 on the Clyde, in 1836 on the Durham railway , and from 1839-1847 in Australia, from 1855-61 on the Blyth Tyne railway, from 1861 till his death in 1908 he managed the Rhymney railway in Cardiff. 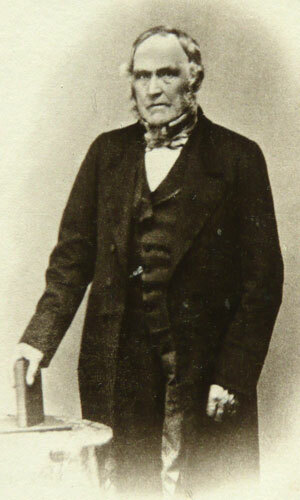 Johnny was the first child of William and Eliza. Morrison. 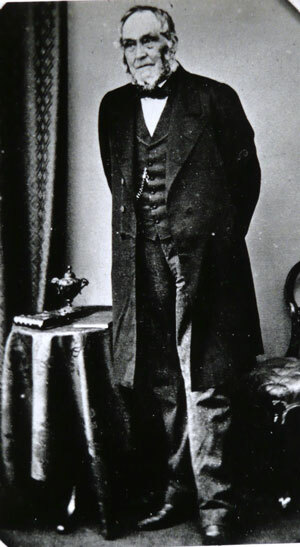 He was born on 9 August 1837. Culley: Brothers George Culley [1735-1813] and Matthew Culley [1731-1804] were well known for introducing the Border Leicester sheep and many agricultural improvements, they had helped John Grey of Dilston in his youth. This Culley may be a relative. 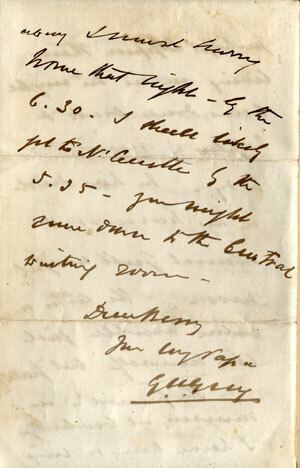 Letter from John Grey addressed to George Grey, 3 Burleigh Street, Strand. Postmarked August 19 or 29 1837. You will see the Agricultural Society’s meeting advert. for 10th October, in this week’s paper. I have no companion here by Bunny & she is hearty. The field names at Milfield included:Ox Close, Wheat Riggs, Whitton Hill, and three called Common. Fitzclarence at Etal: The Etal estate was passed to the widow of Lord Frederick Fitzclarence. Lord Frederick Fitzclarence was the illegitimate son of King William IV and Mrs Jordan. Lord and Lady Fitzclarence made their home at Etal, and when his Lordship died as Commander in Chief of the Army in Bombay in 1855 his body was interred at Ford. "Gowk" a fool or simpleton. Ossulston: Charles Augustus Bennet, 6th Earl of Tankerville PC (10 January 1810 – 18 December 1899), styled Lord Ossulston between 1822 and 1859, was a British peer and Conservative politician. Owned Chillingham castle. In Northumberland Histories Vol. XIV. Pub. 1935 on p.175 there is a Selby of North Earle family tree. Robert Selby of North Earle born 2 Sept 1798 educated at Alnwick, wine merchant in York Street, Covent Garden. He married Catherine daughter of George Jackson a tailor of Bedford Street, Covent Garden in London in 1822. 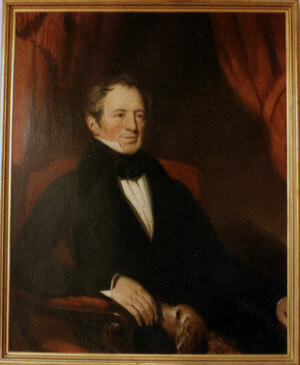 He sold North Earle in 1828 to William Roddam. His father was Robert Selby of North Earle who died 21 Dec 1799 and was buried at Wooler. A record on ancestry for a Robert Selby born on 2 Sept 1798 at Doddington lists his mother as a Christian Grey. It is not yet known how she fits into the family. His family can be found on the 1841, 1851 & 1861 census. 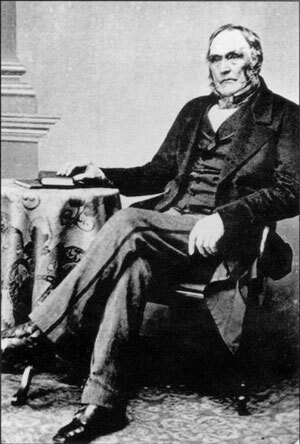 He died on 31 July 1865 at the age of 67. He was buried at Norwood cemetery, Norwood Road, Lambeth on 5 August 1865. "Abode Kennington Road, removed from Eastbourne"
Photo from the Josephine Butler archive, LSE Library collections. Ref 3AMS/G/04/098. Carte de visite by "Bentley, Photo. Buxton & Exchange Arcade, Manchester. "Annotated "Mr. John Grey" A poor copy but it appears to be the original for the engraving on the right. Engraving used on the frontispiece of "Saddle and Sirloin- or English Farm and Sporting Worthies"by the Druid (H. H. Dixon.) Published in London in 1870 Rogerson and Tuxford 265, Strand.